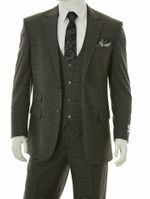 Contemposuits.com is Proud to Present Vittorio St. Angelo Suits. Vittorio St. Angelo menswear specializes Italian design that come in both traditional designer style Mens Suits as well as Mens Fashion Suits that are full cut to Linen Suits for the fashion forward Man who also likes wearing Stacy Adams Shoes. 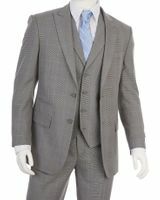 Vittorio St. Angelo Suits are inexpensive priced Italian designer Mens Suits and stellar looking mens fashion suits that are well made at a reasonable price using quality construction and tailoring that you want in your designer menswear. Whether you wear full cut suits or you're of the younger generation and prefer slim fit suits, You simply can't go wrong purchasing a Vittorio St. Angelo Suit. Chances are you're going to need some new dress shoes as well. Don't forget to checkout our selection of Stacy Adams Suits Here. Find More Classic Style and Mens Suits Here. Checkout our Huge Collection of Urban Men Suits Here. Do You Like Genuine Crocodile Shoes. If Style is What You Crave, checkout our Huge Selection of Mens Fashion Suits.